I want to introduce you to some of my favorite toys. My large blue GoDog Dragon from Quaker Pet Group was one of the first toys I ever picked out myself at the pet store. I got him for my first birthday, almost 6 years ago. Yes, I know you don't see a large blue dragon in the photo. BOL!! 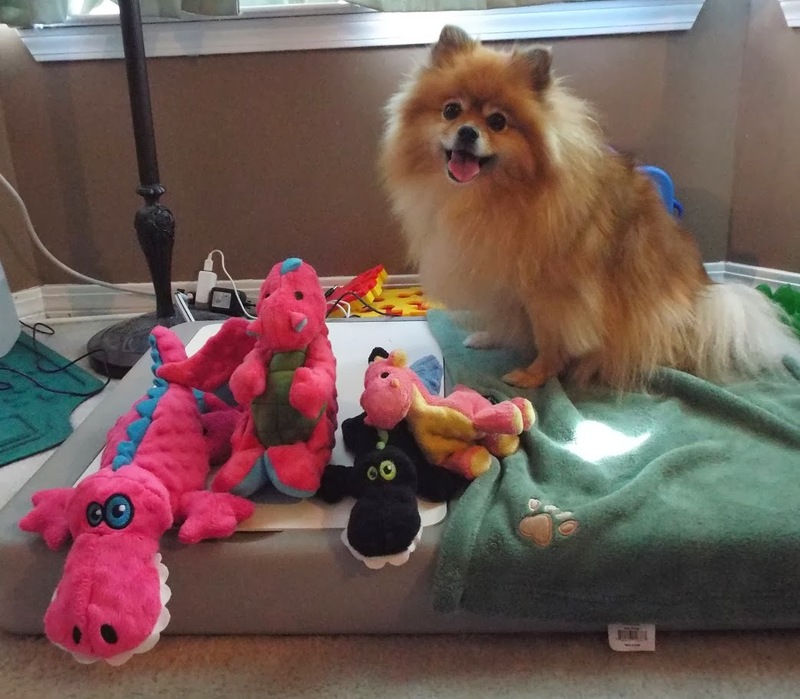 The GoDog toys in the photo are my new ones! In 2013, QPG introduced GoDog toys in my favorite color - pink! Naturally I barked that I wanted a big pink dragon! After I returned home from my Global Pet Expo 2013 trip, QPG sent 2 of their new Gator toys for me to play with. I have a little black one that squeaks! The Gators are also made with that super furrific bubble fabric! Of course they sent a large pink Gator for me too! Instead of a little squeaky sound, it makes a honking sound with its big squeaker. I love that sound! Don't you just love blurry action photos? BOL! 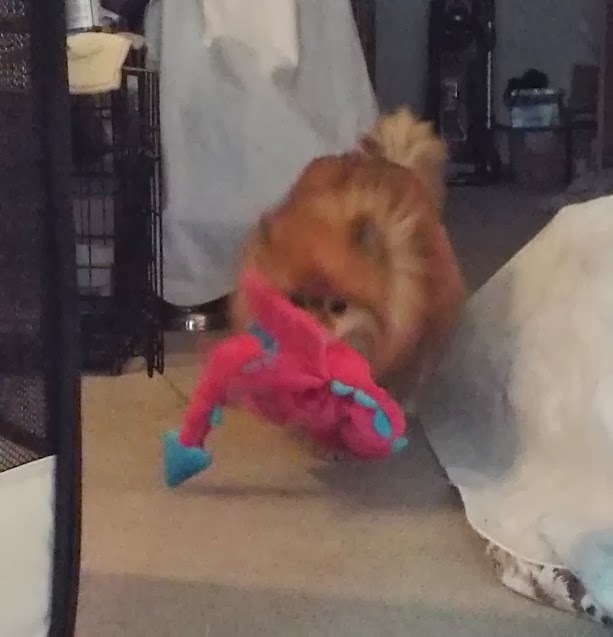 Late in the summer I received the toy I had been wishing for - The big pink Dragon! Happy wiggle dance! It makes that pawsome honking sound just like my big blue one, but it's pink! This GoDog Dragon is so me! BOL! I wanted to bark about it immediately, but I had a very full schedule with my travels and the holidays - so I had to keep quiet until now. Now I can bark as loud as want to - "I have a big pink GoDog Dragon!" All GoDog toys feature Chew Guard Technology. They are lined with a special fabric and double stitched. GoDog toys have a toughness guarantee. QPG will replace a destroyed GoDog toy - (limit of one-time, one replacement per household). Would you like to win a GoDog toy? 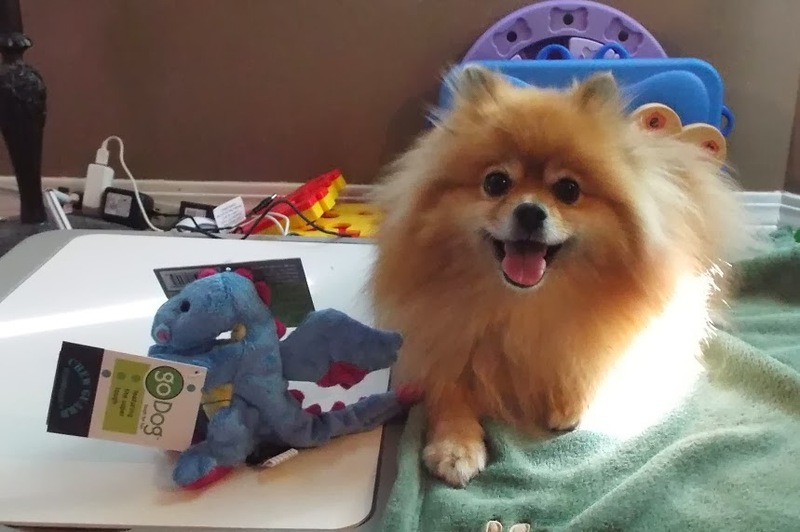 I have a little blue GoDog Dragon to giveaway! Login to the Rafflecopter for entry options. Giveaway Disclosure: I did not receive any monetary compensation for this giveaway. I was given a free product to giveaway. I am not responsible for lost/missing prizes. The opinions in this giveaway are my own and not influenced by any outsider . I receive no additional benefits for talking about the product or company. Oh boy, I would love that blue dragon! And I have a Gotcha Day coming up next month! Pepper...I LOVE the gator!!! How perfect for dogs who live in Florida or the South where we have real gators! The pink dragon and pink gator are just perfect for you. You look like you LOVE playing with them. How awesome these are! We haven't got any GoDog toys, but Huffle would sure love one! Don't have any - they look fun! OMD! Pepper I love pink to :) The toys are beautiful!! Those are so cute Pepper! Love that big pink dragon too. Very girly! Will pass on this giveaway as I think the little blue dragon might be better for a smaller doggy like you! Maya and Pierson have never had a GoDog toy. Those are so cute! I love dragons and think it would be adorable if Maya and Pierson had one. Pierson a blue and Maya a pink. Melvin doesn't have one yet. We have looked at the gator before! My dogs only recently really started playing with toys. I have five rescued Treeing Walker Coonhounds, and while they would play with ropes and balls in the yard, they never really showed much interest in plush dog toys (except maybe to tear one to pieces in two minutes). 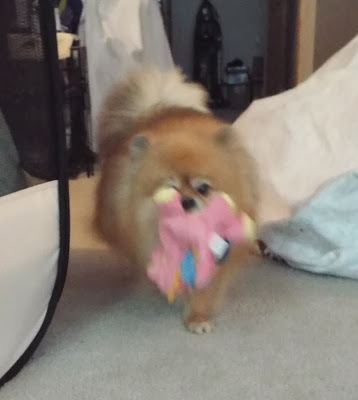 Lately, though, they have started playing with toys and I started getting a small collection of them for my furbabies. I don't have any GoDog toys - yet - but while the dogs likely won't care what it looks like I know I'd like the dragon for them. I'm a big fan of fantasy, and as my daughter is always naming everything in our house, a dragon dog toy would likely get named "Smaug" or something. I don't have any GoDog toys! Our German Shepherd puppy, Karlie, loves playing with toys! OMD!! Pepper, you have the bestest stuffies EVERS!! I loves that pink dragon too! I thinks your action shots are the bestest!! Looks like your givin' those stuffies all you got! I gotta to tell Ma to look for these! 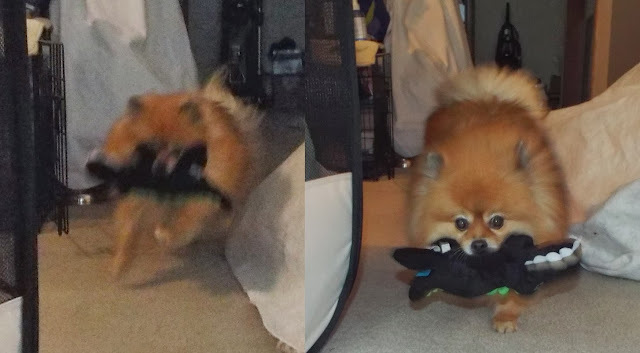 Pepper though some pictures are blurry because you are in action but we can tell how much fun you are have with the GoDog toys. I hope I can win a toy. Thank you for such an excellent blog. My little sister would love those as she loves crinkle toys, but we won't enter the giveaway as she needs a big one. We will have to look for one in the store or online. Thanks for the review. We have one of the monkeys with the arms and legs that you can pull and tug. We love it! It's one thing that Sissy has not destroyed. We love love love dragons in this house! We don't have any go dog toys, but I'd love a dragon. You sure you won't give away the pink one? I love pink too! What cute toys, we don't have any, but we could sure use anything with "chew guard" in our house! We don't have any currently, but that pink dragon is awful cute. i never heard of them but excited to give one a good play through! No, I don't have any GoDog toys. i had not heard of the company until reading this review! i love those little dragons though! We don't have any GoDog toys, but checking out their website, the Furry Flatties are pretty cute! A Possum! Stopping by to let you know you have been nominated for The Versatile Blogger award. Visit The Kitty Corner http://thekittycorner.wordpress.com/2014/01/12/the-versatile-blogger-award for all the details! i havent heard of this brand - but i love the cute dragons! We have their yeti toy. It's Onyxx's favorite. 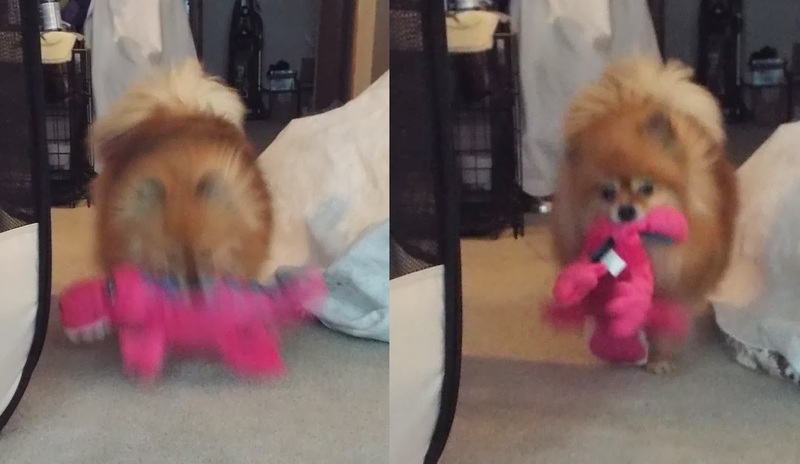 Go Dog toys are the BEST! I have a dragon too! We don't have any of these toys yet but I know my dogs would love testing out that Chew Guard Technology! Hope we win! Pepper you make it look like so much fun! We don't have these toys yet and my Cocker Spaniels would LOVE testing the Chew Guard Technology! Don't have any GoToys but my favourite is Item #770738, Mr. Frog. Too adorable.